COLBY FAMILY & OTHERS, at http://freepages.genealogy.rootsweb.com/~colby/colbyfamciting FHL Film: 1000488; Index to births, early to 1900 New Hampshire. Registrar of Vital Statistics. 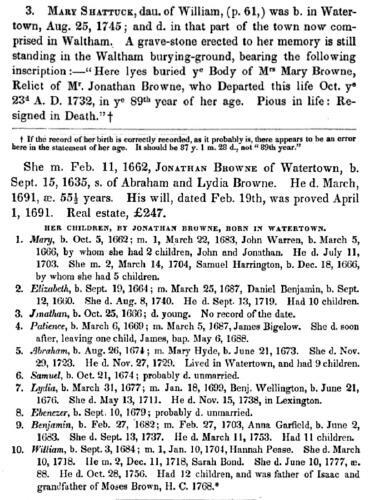 COLBY FAMILY & OTHERS at http://freepages.genealogy.rootsweb.com/~colby/colbyfam, citing FHL Number 1000976; Marriage: Hannah L. BROWN, Date: 05 Dec 1826; Recorded in: Birth and Marriage Index for New Hampshire. COLBY FAMILY & OTHERS at http://freepages.genealogy.rootsweb.com/~colby/colbyfam, citing "History of the town of Bristol, Grafton County, New Hampshire" Bristol, N.H.: Printed by Richard W. Musgrove, 1904. "Massachusetts, Births, 1841-1915," index and images, FamilySearch (https://familysearch.org/pal:/MM9.1.1/FXF8-LNR : accessed 12 February 2015), Hollis L. Brown, 09 Feb 1903; citing Salem, Massachusetts, reference p 605 n 100, Massachusetts Archives, Boston; FHL microfilm 2,057,434. "Massachusetts Death Index, 1970-2003," database, FamilySearch (https://familysearch.org/ark:/61903/1:1:VZRQ-WBB : 4 December 2014), Iva M Andrews, 27 Nov 1996; from "Massachusetts Death Index, 1970-2003," database, Ancestry (http://www.ancestry.com : 2005); citing Lawrence, Massachusetts, death certificate number 056343, Commonwealth of Massachusetts Department of Health Services, Boston. 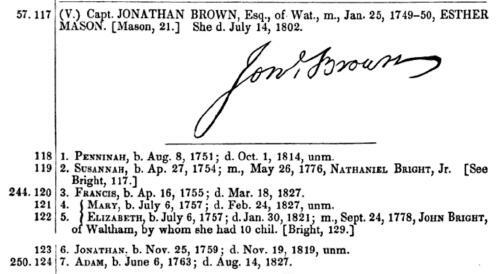 Jabez Brown was born in 1791 or 1792 in Waterford, Oxford County, Maine. On August 27, 1824, Jabez married Sally Hamlin of Waterford. On August 27, 1824, a son, Daniel Waldo, died of dysentery in Waterford, Oxford County, Maine. On September 1, 1824, a daughter, Angeline, died of dysentery in Waterford, Oxford County, Maine. 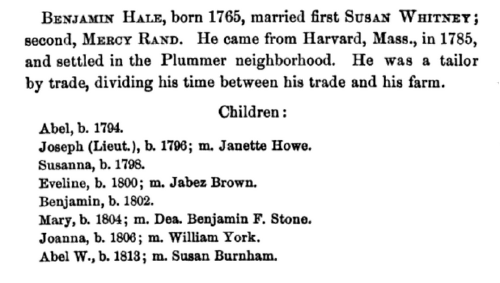 On September 5, 1824, a son, Europe Hamlin, died of dysentery in Waterford, Oxford County, Maine. In 1826 or 1827, daughter, Fanny, was born in Maine. In December, 1826, a daughter Angeline, was born. She died of dysentery. in Waterford, Oxford County, Maine. In 1828 or 1829, a daughter, Mahala, was born in Maine. About 1830, a son was born.. In 1832 or 1833, a daughter, Angela, was born in Maine. About 1835, a child was born. In 1836 or 1837, a daughter, Clarissa, was born in Maine. In 1839 or 1840, a daughter, Melinda, was born in Maine. On February 4, 1839, the child who was born about 1835 died in Waterford, Oxford County, Maine. In 1842 or 1843, a daughter, Caroline, was born in Maine. On March 24, 1844, the son who was born in 1830 died in Waterford, Oxford County, Maine. On July 24, 1851, a daughter, Melinda, died in Waterford, Oxford County, Maine. On June 19, 1853, his first wife, Sally, died. 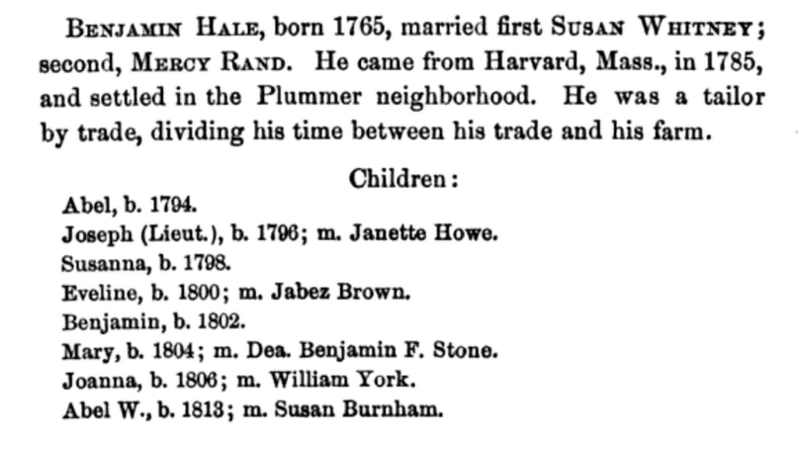 Jabez married Eveline Hale, daughter of Benjamin Hale and Susanna Whitney, on July 29, 1854 in Waterford, Oxford County, Maine, but apparently divorced by 1860, as subsequent censuses list both of them, but not together. Thomas W. Baldwin, Vital Records of Cambridge, Massachusetts, to the year 1850, Boston: Wright & Potter Print. Co., (1914) , Vol. 1, p. 96. Thomas W. Baldwin, Vital Records of Cambridge, Massachusetts, to the year 1850, Boston: Wright & Potter Print. Co., (1914) , Vol. 2, p. 53. 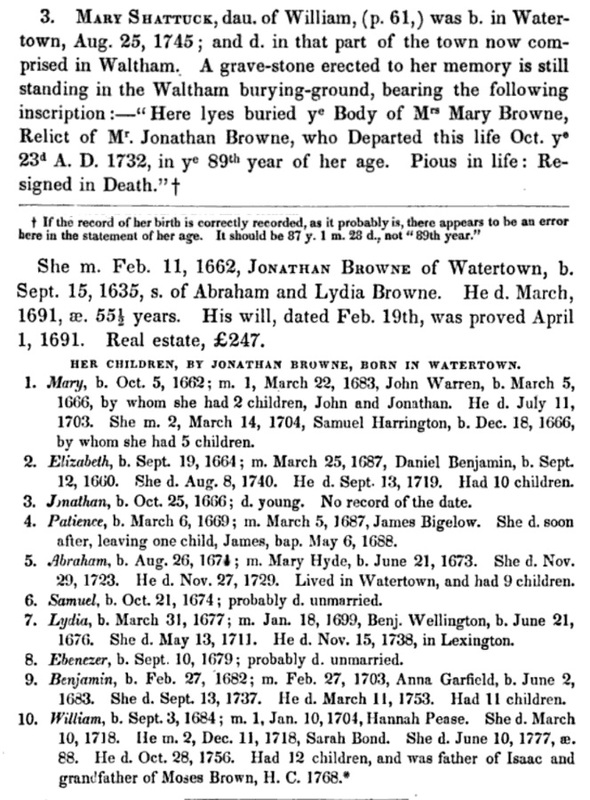 "Massachusetts Births and Christenings, 1639-1915," database, FamilySearch (https://familysearch.org/ark:/61903/1:1:V5NZ-XH2 : accessed 21 December 2015), Mary Brown, ; citing , ; FHL microfilm 974.47 B1 V2E. Massachusetts Births and Christenings, 1639-1915, at https://www.familysearch.org, Indexing Project (Batch) Number: I00884-0, Source Film Number: 745869, Reference Number: p 315. Henry Bond, Genealogies of the Families and Descendants of the Early Settlers of Watertown, Massachusetts, , at https://books.google.com/books?id=_oc6AQAAIAAJ . Boston: Little,Brown & Company, (1855) , p. 134. Lemuel Shattuck, Memorials of the descendants of William Shattuck, , at https://books.google.com/books?id=JqhRAAAAMAAJ . Boston: Printed by Dutton and Wentworth for the family, (1855) , p. 68. Henry Bond, Genealogies of the Families and Descendants of the Early Settlers of Watertown, Massachusetts, , at https://books.google.com/books?id=_oc6AQAAIAAJ . Boston: Little,Brown & Company, (1855) , p. 122. "Massachusetts, Births, 1841-1915," index and images, FamilySearch (https://familysearch.org/pal:/MM9.1.1/FX8R-PP6 : accessed 11 February 2015), Joseph H. Brown, 27 Apr 1880; citing Salem, Essex, Massachusetts, reference 312, Massachusetts Archives, Boston; FHL microfilm 1,428,173. Massachusetts Births and Christenings, 1639-1915, at https://www.familysearch.org, Indexing Project (Batch) Number: I00884-0, Source Film Number: 745869, Reference Number: p 334.